Sydney is a toddler who lives at home with her parents. She receives daily care from her immediate and extended family members (i.e., grandparents, aunts, and cousins). Sydney has a diagnosis of cerebral palsy and attends her local Early Intervention program. She receives physical and occupational therapy. As she aged, her service providers became concerned with her motor skill development, especially her difficulty in learning to stand and walk. At the age of 18 months, the Individual Family Service Plan (IFSP) team agreed to include assistive technology to promote standing and walking in her home and childcare center. Although Sydney’s family agreed to the use of assistive technology (AT), for some families, AT is a novel concept that takes time to learn, use, and advocate its functional importance across routine based activities. Family and caregivers of children with disabilities may see multiple barriers that effect the child’s development, compared to typically developing children. Kang et al (2017) discuss the environmental, social, and attitudinal barriers many families and caregivers of children with disabilities report face compared to families and caregivers of children without disabilities. Families identify lack of resources, equipment, training, and inclusivity that hinder their child’s development compared to children without disabilities. Environmental knowledge (i.e., resources, coaching/training, family support, etc.) can help families of children with disabilities to feel included in their community and promote the overall well-being of their child’s development (Kang et al, 2017). AT devices and strategies are crucial components that help caregivers include children in routine-based activities across a variety of environments. Sydney and her family were more easily included in community based activities by using AT. Many young children and their families depend upon AT resources and services to promote function across routine activities and environments. Children with disabilities or delays use AT to access their environment so they can move, play, and communicate safely and effectively. The Individuals with Disabilities Act (IDEA) defines AT “as any item, piece of equipment, or product system, whether acquired commercially off the shelf, modified, or customized, that is used to increase, maintain, or improve functional capabilities of a children with a disability (§602(1), 2004).” IDEA (§602(2), 2004) specifically distinguishes AT services from AT devices and defines AT services as “any service that directly assists a child with a disability in the selection; acquisition, or use of an assistive technology device. This definition highlights that for children and families similar to Sydney’s, AT can be a specific device or a service that is provided to train families to use and maintain the device in order to use it across activities and ensuring that the families have many opportunities to implement learned strategies. The IFSP team meets to discuss the need for including AT devices and services in the plan to accomplish family-centered outcomes. The team, which always includes the family, considers the implications for AT use to facilitate effective child involvement in routine-based activities. Sydney’s family and the rest of the IFSP team discuss multiple factors that can affect the success of using the device. Factors such as the persons who Sydney will be interact with, the activities she will be involved in, the environments in which she will use the device, and what types of technology are available all contribute to the decision making process. 1. Have previous interventions, modifications, and strategies not led to the functional results desired by the team; 2. Has there been a change in environment or circumstance; 3. Has the child’s skills or behavior changed; 4. Is there a change in technology (e.g., compatibility issues)? The Student, Environments, Tasks, and Tools (SETT) framework (Zabala, 2010), is used by the IFSP team to consider all aspects of AT decision-making, helping the team make the most efficient, effective and functional recommendations for the device and services ensuring that the child and family will use the device across environments and by many caregivers. This eight-step decision-making process accounts for the interconnections among the: 1) child, 2) environments, 3) tasks, 4) tools, and the need for 5) ongoing evaluation and modification. Dunst, et al (2013) concluded in his meta-analysis that AT devices “promoted child engagement” in routines (e.g., playing with toys, self-feeding, moving around the home) that may otherwise be very difficult or impossible to achieve. AT devices were shown to positively impact the attainment of outcomes regardless of age, disability, or severity of child’s intellectual delay (Dunst, et. al, 2013). AT devices and strategies that are designed in light of family-centered outcomes promote multiple opportunities for the child to achieve success. Sydney’s family and service providers collaborate with each other to ensure ease of device use and activity implementation. Unfortunately, studies indicate many families and service providers “abandon” AT devices and strategies after initial implementation. 1. Limited access to Early Intervention specific AT implementation strategies (i.e., routine-based intervention, least intrusive device/strategy across environments, etc.) 2. Lack of evidence-based practices implemented by service providers and family members when using IFSP defined AT devices and/or services; 3. Limited consideration of ongoing AT device maintenance or strategy modification as the child ages or family circumstances change. Recent studies have demonstrated the necessary attitudinal shifts of parents and caregivers occur when provided sufficient and effective coaching to implement AT devices and strategies across environments and daily activities. Tamakloe and Agbenyega (2017) concluded that outcomes were achieved when childcare center teachers and staff used AT devices and strategies. Based on a survey that questioned the staff’s interactions with AT, the authors concluded that ‘maintaining positive attitudes’ were paramount for learning, maintaining, and modifying AT device usage of children with disabilities in the classroom. Service providers must provide optimal training and coaching in how to incorporate AT devices in routine based activities. Nelson, et al (2013) reported, based on interviews with teachers about their perceptions of AT use in the classroom, that teachers must know when technology will be beneficial in the classroom, as well as counterproductive to a child’s learning. Both low and high tech devices are appropriate for use by young children in the classroom, home, and community. Children use low-tech device to participate successfully in routine-based activities in the classroom and community. Sydney’s family and service providers collaborated, coordinated, and executed an IFSP to include AT device(s) and strategies to address the family-centered outcomes. The family received coaching and training on how best to incorporate these devices in their daily activities to support Sydney’s motor skill development. The family and service providers coached and trained Sydney’s childcare center staff to ensure the AT devices and strategies were frequently and effectively included in the classroom’s daily routine. Providing the equipment, resources, and skills can help resolve environmental, social, and attitudinal barriers that would impede Sydney’s overall development. Dunst, C.J., Trivette, C.M., Hamby, D.W. (2013). Systematic review of studies promoting the use of assistive technology devices by young children with disabilities. Research Brief Volume 2, Number 1. Tots-n-Tech Research Institute. Nelson, L.H., Poole, B., Munoz, K. (2013). Preschool Teachers’ Perception and Use of Hearing Assistive Technology in Educational Settings. Language, Speech, and Hearing in Schools. 44. pps. 239-251. Sawyer, B., Milbourne, S., Dugan, L., Campbell, P. (2005). Report of assistive technology training for providers and families of children in Early Intervention. Research Brief Volume 2, Number 1. Tots-n-Tech Research Institute. Simpson, L.A., Oh, K. (2013). Using Circle Time Books to Increase Participation in the Morning Circle Routine. Teaching Exceptional Children. 45; 6, pp. 30-36. Isn’t it unfortunate that there are preventable diseases, disorders, and conditions that still occur? As a nation that claims to value children, it is even more unfortunate that many people do not take plausible precautions when they could prevent later consequences. However, with the scientific and medical advancements that are constantly being discovered and implemented in the U.S., we have established a system that compensates for the lack of prevention with early intervention services. That is, of course, if you are aware of and have resources to access the use of preventative and intervening resources. Fetal Alcohol Syndrome Disorder (FASD) is an example of this issue. FASD is completely preventable. In some areas of the U.S., the number of children identified with FASD has decreased since1973 (Jones and Smith) when the disorder was first identified. However, the Native American community continues to experience a disproportionate number of children with FASD. It is estimated that 29.9 American Indian infants out of every 10, 000 live births have FASD. FASD is one of the most prevalent disorders that Native Americans face. FASD is a spectrum disorder characterized by structural anomalies and behavioral and neurocognitive disabilities in children resulting from a mother’s alcohol consumption during pregnancy (Beckett, 2011). Members of the Native American community experience high rates of alcoholism, and women tend to drink during their pregnancies and during labor, women use alcohol and drugs to numb their labor pains (Beckett, 2011). This alcohol use may be due to the lack of awareness about the dangers of alcohol consumption during pregnancy to unborn children. Currently, there are programs specifically designed to educate the Native American community and provide resources for them. With help from the Substance Abuse and Mental Health Services Administration (SAMSHA) and the National Organization on Fetal Alcohol Syndrome (NOFAS), the Navajo Nation FASD Prevention Program, developed a creative and culturally sensitive program that has aided over 40,000 members of their tribe (Beckett, 2011). Unfortunately, because this program is only open to members of Navajo Nation, other Native Americans tribes cannot access it. However, SAMSHA and NOFAS attempt to provide resources throughout the entire Native American population. One innovative program was established by Morgan Fawcett, who is affected by FASD. He travels throughout the U.S. explaining FASD, discussing prevention strategies, and providing services needed for those affected by FASD (Ulen, 2011). Although the efforts taken by these organizations and people yield positive effects, they have not caused long-term change in the communities. Members of Native American communities are almost two times as likely to have FASD than white Americans not only due to the lack of education, but also because of the lack of appropriate medicine and access to clinics. The inability to seek assistance may play a part in the higher alcohol consumption by the Native American population. The Indian Health Service (IHS) is supposed to provide “federal health services to American Indians and Alaska Natives” (Indian Health Service). However, with their limited number of hospitals, health centers, and health stations, members of the communities cannot access the appropriate treatment or therapy they may need to moderate their alcohol consumption. The hospitals and health stations that members can use to obtain intervention are limited, and they may be located very far from the community. Although the primary goal of the IHS is to provide health care for American Indians, only 20% of community members use the services due to lack of accessibility. For example, a woman from the Assiniboine Tribe on the Fort Belknap Reservation drove over 35 miles to reach the health station, and waited for hours to receive her prescription, only to realize upon her arrival back home that she had been given the wrong medication (King, 2016). In order to decrease the rate of FASD in Native American communities, the IHS, in addition to the Substance Abuse and Mental Health Services and the National Organization on Fetal Alcohol Syndrome, need to create culturally sensitive programs that can adequately educate people about FASD and provide resources for the Native American communities. To address intervention, the IHS should develop more services and supports closer to reservations or provide free transportation. A key factor in addressing FASD is educating leaders from the communities so they can disseminate the importance of sobriety before and during pregnancy while also explaining what resources are available to families if a child is affected by FASD. These improvements could help to significantly decrease the high rates of FASD in the Native American population in the U.S.
Jones, K. L. and Smith, D. W. (1973) Recognition of the fetal alcohol syndrome in early infancy. Lancet, 999–1001. Mental Health: Culture, Race, and Ethnicity: A Supplement to Mental Health: A Report of the Surgeon General. (2001). Substance Abuse and Mental Health Services Administration, Ch. 4. Retrieved from http://www.ncbi.nlm.nih.gov/books/NBK44242/. Inclusion of young children in early childhood programs-A Utopia? The 1960s was a remarkable decade for the US as the outcomes of the Supreme Court’s 1954 Brown vs. Board of Education of Topeka decision affected social policy, politics, and education greatly. During this period the federal government was involved in the protection of civil rights for all it citizens and ensuring that the laws were enforced. The educational system was closely examined and new initiatives were implemented leading to significant reforms. Through these reforms, it was discovered that special education was a string attached to the system and could not be left behind. Since then the federal government has promoted initiatives to benefit and support children with disabilities. While the recommendations present a good level of feasibility, the local recommendation that calls to “Enhance Professional Development” for the teachers could present challenges. This recommendation places high expectations on staff for continuing education. Unfortunately, many early childhood providers have only basic education in child development and limited time and finances for professional development. The recommendation indicates that, “High-quality staff should have knowledge, strong competencies, which include competencies in culturally and linguistically responsive practice, and positive attitudes and beliefs about inclusion and disability in order to foster the development of all children. In addition, they should have a strong understanding of universal design and universal design for learning.” (ED &HHS, 2015, p. 16). When taking a close look at the early childhood workforce it is well known that is fragmented and in crisis. Beside the reasons mentioned above, there is a high turnover, instability, and a few workers with appropriate credentials, and these could eventually hurt the consistency of care. Attainment of quality workers for any center is hard as well, especially when a miserable pay scale is not attractive to highly qualified professionals. To expect that early childhood providers obtain those skills and competencies states and jurisdictions should provide resources to build a strong, knowledgeable workforce and infrastructure. How can we expect early childhood providers to possess the knowledge, the skills, and attitudes to ensure high quality teaching? How can we attain and retain teachers with a sustainable capacity to provide optimal services to children with special needs within their classrooms? How can we expect the early childhood teachers to work collaboratively with a variety of specialist who know little about early childhood curricula, standards, and expectations? Resources are needed to create innovative, accessible supports to meet these expectations. The recommendations must be seen as an opportunity to enhance early childhood professional development rather than a barrier. While we can ask many questions and list several challenges, we need to see this recommendation as the stepping-stone for providers to undo mindsets, raise awareness about inclusion within their own centers, advocate for training, ultimately including children with special needs in their programs. Nine percent of US children between the ages of two and three have at least one diagnosed mental, behavioral, or developmental disorder (Bitsko et al., 2016). In 2015, 350,581 children received early intervention services under Part C of the Individuals with Disabilities Education Act (IDEA). However, a recent study found that 24% of all two-year olds were deemed ineligible for early intervention services (EI) at two years of age but experience poor academic and behavioral outcomes upon entering kindergarten (Nelson et al., 2016). Social emotional and behavioral difficulties seen at early ages often predict social challenges later in life (Briggs-Gowan, 2008). However, EI rarely addresses the needs of the children who display social, emotional and/or behavioral challenges and their families unless the child demonstrates a significant developmental delay. This is concerning considering the vast body of research (Mistry et al, 2010; Sektnan, 2010; Shonkoff, 2012) indicating “long-term developmental-behavioral and educational outcomes are strongly associated with socioeconomic factors” (Nelson et al., 2016). Children who are exposed to multiple social risk factors, such as poverty, domestic or community violence, substance abuse, etc., have a higher risk of experiencing mental health issues (Bjorkenstam, 2017). Unfortunately, the current EI system doesn’t seem to have the capacity to adequately address the social emotional needs of these children. This blog will explore opportunities for the current EI system to improve its services related to social emotional development. Early intervention, as described by Part C of the Individuals with Disabilities Education Act (IDEA), is a comprehensive, multidisciplinary system of services intended to enhance the development of infants and toddlers; maximize the capacity of families to meet their child’s needs; and encourage independent living (ECTA, n.d.). In 1986, Congress established Part C to assist states in supporting the developmental needs of children birth to age three in five developmental categories: physical, cognitive, communication, social emotional, and adaptive. Although the federal government requires each state to have an EI program to address these 5 developmental domains, the eligibility requirements and implementation guidelines vary from state to state. Due to a variety of factors, (administrative, professional licensure, payment, etc. ), the implementation of early intervention is more in line with a predominantly medical model of service provision despite research supporting family-centered models as the preferred practice (Bruder, 2010; Hoffman et al., 2016). Over the past 30 years, the idea of addressing an underlying medical concern or impairment has become central to early intervention service systems (NCCP, 2009). This traditional model is based on a direct service delivery system, in which one provider delivers specific therapeutic intervention to an individual child. The narrow, developmental delay-based eligibility criteria in use by many states may also prevent children with social-emotional considerations from being found eligible for services (Ringwalt, 2015). Unless a child has delays in other areas of development, children with social emotional concerns are considered at-risk. As of 2015, only seven states offered services to at-risk children (Ringwalt, 2015). This statistic is especially troubling when considering the growing body of knowledge on children with social-emotional difficulties, as well as behavioral concerns, contributing to preschool and child care expulsions (Gillman, 2005; Perry et al., 2008; US Department of Education, 2014). As concerns about social emotional development in young children increase, it may prove worthwhile to explore how EI programs can collaborate with early childhood mental health professionals. In contrast to a variety of direct therapeutic services offered by EI, Early Childhood Mental Health Consultation (ECMHC) indirectly supports children who are experiencing social-emotional or behavioral difficulties, their families, and their teachers. It seems reasonable that the EI and the ECMH fields would be natural collaborators but there exists little evidence to support this. How then, can these two support systems collaborate to build a truly comprehensive, well-coordinated system of care that effectively promotes positive development in all domains? 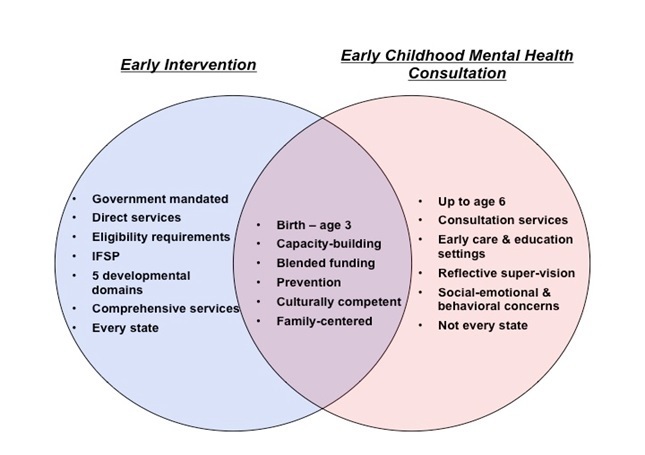 ECMHC is a “problem-solving and capacity-building intervention” intended to improve the ability of caregivers to “prevent, identify, treat, and reduce the impact of mental health problems among children from birth to age six and their families” (Duran et al., 2009). Multiple states across the nation have begun implementing their own ECMHC programs, as ECMHC has been shown to be an effective strategy for improving challenging behaviors and “supporting young children’s social/emotional development in early childhood education settings” (Duran et al., 2009). Maryland’s ECMHC Evaluation, a three-year study designed to evaluate ECMHC’s impact on early childhood education (ECE) environments, found that ECMHC intervention in childcare settings decreased problem behaviors in the classroom, improved social and emotional functioning of the child, and decreased parental stress (Stephan et al., 2011). Despite the research supporting ECMHC as an effective intervention strategy, many children and families do not have access to this service. Unlike EI, ECMHC programs are not available in every state. According to Duran, et al (2009), 29 states have formalized ECMHC services. The implementation of these programs varies from state to state, as there is no standardized set of core competencies outlining effective ECMHC (Duran et al, 2009). Based on an analysis of the 29 states with ECMHC, Duran, et al proposed a framework for effective, high-quality ECMHC (Figure 1). This framework outlines the three core components of an effective ECMHC program: 1) solid program infrastructure, 2) highly qualified mental health consultants, and 3) high-quality services. 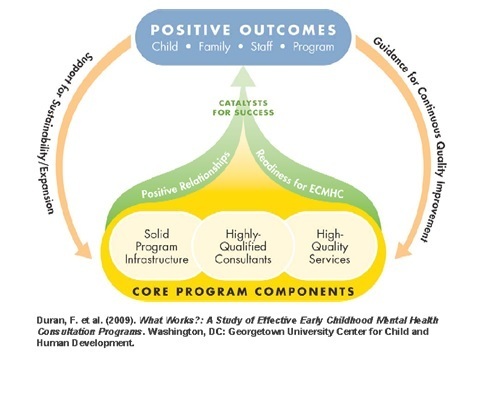 Additionally, the Duran et al study (2009) identified two key elements as the “catalysts for success”: 1) positive relationships between the consultant and consultees and 2) readiness of families and ECE providers/programs for ECMHC. ECMHC and EI: Similarities and Differences? Despite having a number of similarities, EI and ECMHC remain largely unaware of each other. What obstacles may be preventing communication between these two service systems? While EI and ECMHC both focus on caregiver capacity-building, the providers’ approach differs. EI providers work with the child and caregiver directly to meet a list of child-specific, family-centered outcomes. Mental health consultants, however, work almost exclusively with caregivers, as their purpose is to address the caregiver’s concerns within an early care and education setting (Duran et al, 2009). Consultants respond to the caregiver’s concerns by recommending strategies and interventions that promote the successful participation and regulation of the child. As their focus is on the caregiver, the ECMHC may not recognize the need to refer the child to EI. Evidence supporting this argument can be found within Maryland’s ECMHC Evaluation’s Final Report (Stephan et al, 2011). Maryland’s ECMHC Evaluation provided a commentary on the mental health consultants’ knowledge and skills (Stephan et al, 2011). Consultants reported feeling confident about their knowledge of social emotional development. However, consultants felt “least confident about their grasp of early intervention service systems, treatments and family support services” (Stephan et al., 2011). Additionally, the consultants reported having the least amount of experience in providing direct therapy. This feedback indicates that mental health consultants may not be considering delay and/or disability as a contributing factor to the child’s behavior and/or and social-emotional health. However, the argument could also be made that EI providers may not consider the impact poor social emotional health may have on the function of a child with a delay and/or disability. Under Part C of IDEA, EI providers support developmental in all 5 areas (communication, physical, cognitive, social emotional, and adaptive). However, most children receive EI support because of identified delays in motor and/or language development (Bruder, 2010; NCCP, 2009). Even though Part C providers aim to promote positive social-emotional skills, this is often overlooked when determining IFSP outcomes. As a result, EI services are often based on an identified developmental delay and most children receive therapeutic services (occupational therapy, physical therapy, or speech therapy) to remediate a delay (NCCP, 2009). If EI programs focus too narrowly on development delay, children experiencing social emotional and behavioral difficulties may not be receiving the support they need. Collaborating with ECMHC may help raise awareness around the importance of social emotional development at an early age within the EI network as well as support caregivers in promoting this development. Pairing ECMHC’s effective connections with caregivers with EI’s extensive evaluation and service delivery model provides an opportunity to build resilience among the most vulnerable children. Bruder, M. B. (2010). Early childhood intervention: a promise to children and families for their future. Council for Exceptional Children, 76 (3), 339-355.
Cooper, J. L. & Vick, J. (2009). Promoting social emotional wellbeing in early intervention services. New York, NY: National Center for Children in Poverty. Duran, F. et al. (2009). What works? A study of effective early childhood mental health consultation programs. Washington, DC: Georgetown University Center for Child and Human Development. Gilliam, W. S. (2005). Prekindergarteners left behind: explusion rates in state prekindergarten systems. New Haven, CT: Yale University Child Study Center. Perry, D.F., Dunne, M.C., McFadden, L. & Campbell, D. (2008). Reducing the risk for preschool expulsion: mental health consultation for young children with challenging behaviors [Abstract]. Journal of Child and Family Studies. 17(1), 44-54. Shonkoff, P. J. & Garner S. A. (2012). The lifelong effects of early childhood adversity and toxic stress. American Academy of Pediatrics, 129(1), 232-246. Stephan, S. et al. (2011). Maryland’s early childhood mental health consultation evaluation. University of Maryland, MD.